KEY WEST, Fla. — Tropical Storm Isaac barely stirred Florida Keys residents from their fabled nonchalance Sunday, while the Gulf Coast braced for the possibility that the sprawling storm will strengthen into a dangerous hurricane by the time it makes landfall there. It was on course to strike land on the seventh anniversary of Hurricane Katrina, a powerful storm that crippled New Orleans and the Gulf Coast and became a symbol of government ineptitude. Forecasters expected Isaac to pass the Keys late Sunday before turning northwest and striking as a Category 2 hurricane somewhere between New Orleans and the Florida Panhandle on Wednesday. 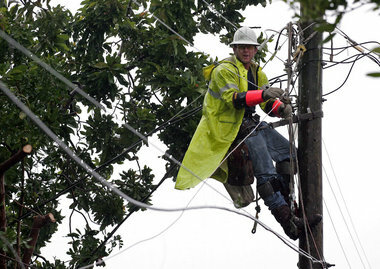 View full sizeDAVID ADAME, Florida Power & Light Co.Florida Power & Light Co. line specialist Dustin Pezet works to restore power as Tropical Storm Isaac strikes in Miami on Sunday. Isaac gained fresh muscle Sunday as it bore down on the Florida Keys, with forecasters warning it could grow into a dangerous Category 2 hurricane as it nears the northern Gulf Coast. The National Hurricane Center issued a hurricane warning for a large swath of the northern Gulf Coast from east of Morgan City, La. — which includes the New Orleans area — to Destin, Fla. A Category 2 hurricane has sustained winds of between 96 and 110 mph (154 to 177 kph). Louisiana Gov. Bobby Jindal called a state of emergency and officials in St. Charles Parish near New Orleans told its 53,000 residents to leave ahead of the storm. Jindal also said he may skip a speaking engagement later this week at the Republican National Convention in Tampa unless the threat to his state subsides. Alabama Gov. Robert Bentley has canceled his trip to the convention because of Isaac, and Florida Gov. Rick Scott also gave up his speaking engagement. Elected leaders’ vigilance toward tropical storms has heightened in the seven years since Katrina struck. Criticism was leveled at officials reaching all the way to the White House over what was seen as the federal government’s slow and bungled response to the storm that killed 1,800. An emergency declaration was also issued in Mississippi by Gov. Phil Bryant amid concerns of storm surge threatening low-lying areas. Oil companies began evacuating workers from offshore oil rigs and cutting production in advance of Isaac. The storm was on a course to pass west of Tampa, but it had already disrupted the Republicans’ schedule there because of the likelihood of heavy rain and strong winds that extended more than 200 miles from its center. Even before reaching hurricane strength, Isaac caused considerable inconvenience, with more than 550 flights canceled at Miami International Airport and about 150 from Fort Lauderdale’s airport. There were scattered power outages from Key West to Fort Lauderdale affecting more than 16,000 customers, and flooding occurred in low-lying areas. Gov. Rick Scott said at a news conference Sunday evening that only minor damage was reported from Isaac. Wind gusts of 60 mph were reported as far north as Pompano Beach, north of Fort Lauderdale. But while officials urged residents in southeast Florida to stay home, that recommendation was ignored by surfers and joggers on Miami Beach and shoppers at area malls. In Key West, Emalyn Mercer rode her bike while decked out with a snorkel and mask, inflatable arm bands and a paddle, just for a laugh. She rode with Kelly Friend, who wore a wet suit, dive cap and lobster gloves. “We’re just going for a drink,” Mercer said. “With the ones that are brave enough like us,” Friend added. Along famed Duval Street, many stores, bars and restaurants closed, the cigar rollers and palm readers packed up, and just a handful of drinking holes remained open. But people posed for pictures at the Southernmost Point, while at a marina Dave Harris and Robyn Roth took her dachshund for a walk and checked out boats rocking along the waterfront. “Just a summer day in Key West,” Harris said. That kind of ho-hum attitude extended farther up the coast. Edwin Reeder swung by a gas station in Miami Shores — not for fuel, but drinks and snacks. With a laugh, Reeder said he has not stocked up aside from buying dog and cat food. The forecast wasn’t funny, however. Isaac was expected to draw significant strength from the warm, open waters of the Gulf of Mexico, but there remained much uncertainty about its path. The Gulf Coast hasn’t been hit by a hurricane since 2008, when Dolly, Ike and Gustav all struck the region. Florida, meanwhile, has been hurricane-free since it was struck four times each in 2004 and 2005. Hurricane center forecasters are uncertain of the storm’s path because two of their best computer models now track the storm on opposite sides of a broad cone. One model has Isaac going well west and the other well east. For the moment, the predicted track goes up the middle. Florida Panhandle residents stocked up on water and gasoline, and at least one Pensacola store ran out of flashlight models and C and D batteries. Scott Reynolds, who lives near the water in Gulf Breeze, filled his car trunk with several cases of water, dozens of power bars and ramen noodles. “Cigarettes — I’m stocking up on those too,” he said. Forecasters stressed that the storm’s exact location remained extremely uncertain — a fact not lost on Tony Varnado as he cut sheets of plywood to board up his family’s beach home on Pensacola Beach. With the storm’s projected path creeping farther to the west, the Mandeville, La., resident joked he might be boarding up the wrong house. “I’m going to head back that way as soon as we are done here to make sure we are prepared if hits there,” he said. Before reaching Florida, Isaac was blamed for seven deaths in Haiti and two more in the Dominican Republic, and downed trees and power lines in Cuba. It bore down on the Keys two days after the 20th anniversary of Hurricane Andrew, which caused more than $25 billion in damage just north of the island chain. In Tampa, convention officials said they would convene briefly on Monday, then recess until Tuesday afternoon, when the storm was expected to have passed. Scott canceled his plans to attend convention events on Sunday and Monday. At Miami International Airport, more than 550 flights Sunday were canceled. Inside the American Airlines terminal, people craned for a look out of one of the doors as a particularly strong band of Isaac began lashing the airport with strong rain and high wind. Michele Remillard said she was trying to get a seat on a flight to New Orleans, well aware the city could be affected by Isaac later this week. In coastal Plaquemines Parish, La., crews rushed to protect the levees that keep floodwaters from reaching that New Orleans suburb. As of 8 p.m. EDT, the storm was centered about 530 miles (100 kilometers) southeast of the mouth of the Mississippi River, according to the National Hurricane Center in Miami. Isaac had top sustained winds of 65 mph (100 kph) and was moving to the northwest at 15 mph (24 kph). Tropical storm-force winds extended outward up to 205 miles (335 km) from the center, meaning storm conditions are possible even in places not in Isaac’s direct path. Tropical Storm Isaac has lashed the Florida Keys and South Florida with wind and rain, but may become an even stronger hurricane as it makes its way toward the northern Gulf Coast. Isaac is expected to make landfall somewhere along the Gulf Coast by Tuesday or Wednesday — the seventh anniversary of Hurricane Katrina. That storm caused disastrous flooding all along the coast. A hurricane hasn’t hit the Gulf Coast since Ike in 2008. Party officials are trying to cram four days of convention events and festivities into three as Isaac approaches. The storm is not expected to directly hit Tampa, but those in attendance — and especially those protesting outside — can expect to get wet. The coming storm has also altered some Republican governors’ plans to attend. Louisiana Gov. Bobby Jindal said he won’t leave the state unless the threat from the storm subsides, while Florida Gov. Rick Scott canceled a speaking engagement and Alabama Gov. Robert Bentley canceled his trip to Tampa. Most of the damage down by Isaac so far has been in the Caribbean. At least eight people were killed by flooding in Haiti, including in tent cities filled with earthquake victims, and two others in the Dominican Republic. Isaac scraped Cuba, downing power lines and trees. As of Sunday night, the storm had hit the Florida Keys with wind and rain, doing little damage aside from scattered power outages. Forecasters say it has been difficult to forecast the storm’s path. The U.S. National Hurricane Center’s forecast map shows that it could hit somewhere along a stretch of Gulf Coast running from southern Louisiana to the western edge of the Florida Panhandle. Those areas are under hurricane warnings. Hurricane center forecasters are uncertain of the storm’s path because two of their best computer models have tracked the storm on opposite sides of a broad cone for much of Sunday. One model has Isaac going well west and the other well east. Officials in Lousiana’s St. Charles Parish near New Orleans have told its 53,000 residents to leave ahead of the storm. Some coastal residents in Alabama have also been told to evacuate.